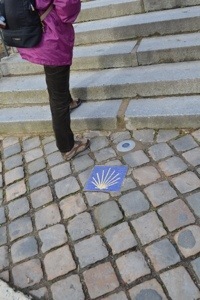 If your eyes are attuned, when you travel around France and Spain there are numerous signs indicating the Camino to Santiago. They are on walls, paths and buildings. They are a silent indication that you are on one of the many paths leading to the Spanish city of Santiago. 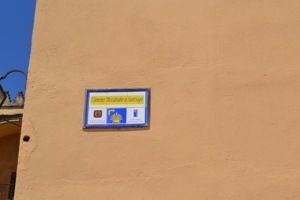 But I had never noticed them until I had actually gone on a portion of the pilgrimage. After that, I bumped into these signs regularly – I began to notice them. Until I had consciously connected these signs with the pilgrimage, these signs were invisible to me. We need to have this sense of attunement too, with the representation of Christ in the Old Testament. The Old Testament, without seeing Jesus is, quite bluntly, a pointless book. The promise of Christ is the backbone that holds the Old Testament together. But when we start to look for him, he is not just in the promises and prophecies, but can also be glimpsed in key people (e.g. Moses – prophet, priest and king), ceremonies and rituals (the sacrifices in Leviticus find their reality in Jesus) and events (the exodus from Egypt and the entrance into the promised land declare so much about Jesus and the reason for his incarnation). The coming of Jesus, and Satan’s desire to prevent his birth is a continuous undercurrent that surges through the highs and lows of God’s people in Old Testament history. What if David had been killed by Goliath or Joseph had been killed by his brothers? What would have happened to God’s promises? O.k. God is sovereign, yet we see that sovereignty against a backdrop of Satan’s hatred and humanity’s sin. The golden thread that draws the Old Testament into a unified story of God’s salvation history is the promise of Christ – the Messiah. One other reason for recognising this important truth: it prevents the Old Testament from becoming just another version of a morality tale alongside brothers Grimm and Hans Christian Andersen. The O.T goes far beyond “daring to be a Daniel” or “having the courage of David” it is about God and his plans to see the King and the Kingdom come. A book that does a wonderful job relating Jesus and his kingdom to the Old Testament is Graeme Goldsworthy’s Gospel and Kingdom. It has been around for a while yet it is still a great introduction to open ones eyes to Jesus, his kingdom and the way it is revealed in the Old Testament. Gospel and Kingdom is a book I have purchased on a number of occasions and yet I don’t have a copy on my shelves because I have given it away or “loaned” it on numerous occasions. Hey bro, I might even quote you in the Newsletter coming Sunday!! Thanks Bob. I was looking for my G&K and I wondered why I couldn’t find it. I must have purchased 6 copies over the years! It’s broad bricht moonlicht nicht t’nicht.